I did a full inspection of my second hive yesterday morning. It’s been over a month since I looked in all the boxes, so despite their grouchiness, it was time to take a peek. I was concerned earlier this summer that the queen wasn’t laying enough, but there were three full frames of brood in the upper hive body and at least twice as much in the lower brood chamber. They also have a good bit of honey stored up for the winter and are starting to draw comb and store honey in the super. 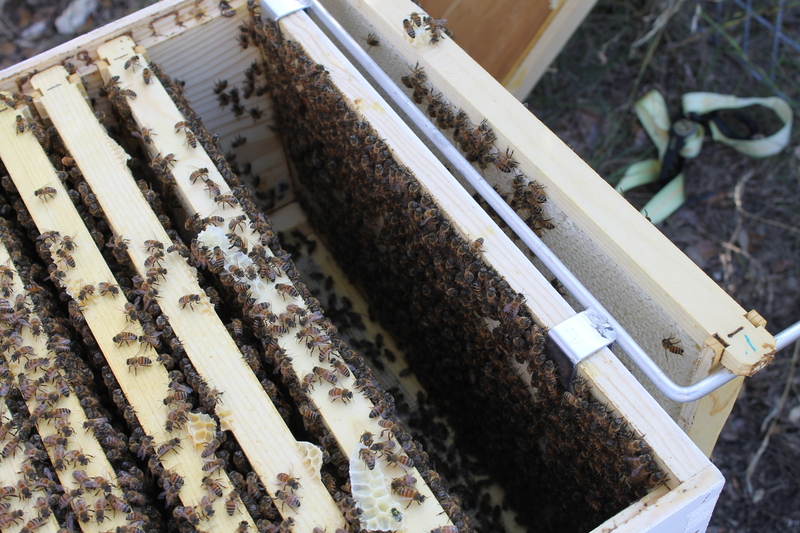 I thought this hive would be pretty messy since they were a split from the first hive, which built comb all over the top bars, connecting layers of frames and making a gooey, honey-dripping mess. However, there was only a little bit of burr comb on the top bars, and it wasn’t full of honey and brood, making it easy to remove and clean up. As far as “preparing for winter” goes, it generally stays so mild during the winter in Texas, there’s not much to do except make sure they have plenty of honey and pollen stored. No worries on the pollen. Both hives have almost an entire frame packed with it. This past spring, I split my first hive and then caught a swarm, which I merged with the split. I don’t think either hive is going to be strong enough to split next spring though, so I’m going to order a box of bees to start my third hive. Unfortunately, BeeWeaver isn’t planning any Austin pick-up locations, so I’ll have to drive an hour and a half to Dripping Springs to get them, and then drive home with 10,000 bees my back seat. I might need a bees-on-board sign. Last summer at the end of August, the bees in my first hive had lots of honey stores, which I left in the hive for their winter stores (far more than they needed, as it turned out). I expected a similar experience this fall, but this year the honey supers look much different: there’s not even close to the same amount of honey. I expected to extract several frames and have plenty left for their winter stores, but instead the frames are either empty or up to half-full. I think a few events this year have caused the low honey production. The hive was so huge and overcrowded in spring that I decided to split it and start a second hive. However, shortly after splitting it, the first hive swarmed at least twice, not only reducing the number of bees in the hive, but taking the queen with them! That meant they had to raise a new queen, which takes some time. And then even more time to wait for her to mate. I replaced their new one in May with a queen from BeeWeaver Apiaries. During the queen upheaval in spring, there was no new brood, so the population of the hive was reduced. There were also about six frames of undrawn foundation (the base plastic on which the bees build their comb) which replaced the frames I had removed for the split. The bees had to draw comb on those frames before the queen could start laying, which also takes time and a good bit of honey. In the meantime, the bees were starting to fill cells that should have house brood with honey and were ignoring the empty foundation frames, the effect of which was reduced space for the queen to lay eggs, so my hive population wasn’t growing as well as it could: fewer bees meant less honey. I did some rearranging in the brood chamber, moving the honey frames to the outside and the empty frames next to frames with brood, hoping to encourage them to start drawing comb on those empty frames. They are starting to do that, but it remains to be seen if they will use it for honey or if the queen will lay eggs there. I think with the honey they are storing in the deep boxes where the brood is raised along with the little bit of honey in the supers, they should have enough for winter without needing any supplemental sugar syrup from me. And really, we still have another solid month of summer before it begins to feel like fall, and then a couple of months of cool weather, and they’ll use that time to continue making and storing honey. Last December, they were still collecting pollen. Perhaps I’ll still have a chance to collect some before winter, but I’ll sacrifice my own wishes for honey to make sure they have enough. And hopefully next spring there won’t be another massive swarm. Next weekend I’ll check the second hive to see how their honey stores are doing and if they will be strong enough to survive the winter. They certainly look busy. I’m still learning a lot, and most of what I’ve learned is bees will do what they want and don’t care much for what I want. As long as both hives survive and continue to grow, I’ll still be a happy beekeeper with Happy Florence Bees.